Director of IfAM, Professor Svetan Ratchev commented: “We are thrilled to be part of this pioneering programme to deliver an advanced aircraft platform that will ensure competitive and green aviation and deliver important high value manufacturing jobs in Europe. 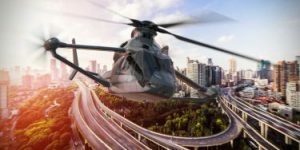 The research is expected to set the standard for aerodynamic efficiency in high speed helicopters. It will also bring about a host of benefits including lighter, high performance, more affordable and easier to fabricate wing structures for aircraft. These benefits would improve resource-­efficiency and therefore have a positive ecological impact. The University’s Advanced Wing Structure for Rotorcraft Additional Lift [ASTRAL] Project has a strong potential for long-term industrial and commercial exploitation of its results. Beyond the end of the project, the Racer demonstrator will be used as a fundamental element to accelerate the transfer of the key wing design, manufacture and assembly technologies to the industry at large.